For the past three summers, Dylan has been attending Nature Camp at the Environmental Nature Center in Newport Beach and this summer will be no different. This is not your typical summer camp. The ENC offers a hands-on experience with nature that takes place in a traditional camp setting - without having to drive into the mountains. For anyone who has been to the ENC, you know that once you enter the main gate you are instantly transported from the busy city streets to the great outdoors. Campers will walk the trails, learn about the ENC grounds and how to respect the plants and animals who live there, make crafts at good old-fashioned picnic tables, and learn all about science and nature. During the ENC Spring Faire, Dylan had the chance to meet some of the special guests who will be joining the campers this summer. Each week is a different theme and includes a special guest or local field trip. There are eight sessions to choose from and surely one that your child will love! Campers learn about everyday things and how to make many of them. Special guest - a real beekeeper! Campers learn how the benefits of recycling, reusing, reducing and more. Beach clean-up and visit to a landfill for older campers. Campers learn how to prepare for the unexpected. Special guest - Coast Live Oak School, ancestral survival skills. Campers learn about marine mammals, sharks, fish, and everything living under the sea. Field Trip to Crystal Cove State park tide pools. Campers learn about a variety of habitats and the plants and animals that live in them. 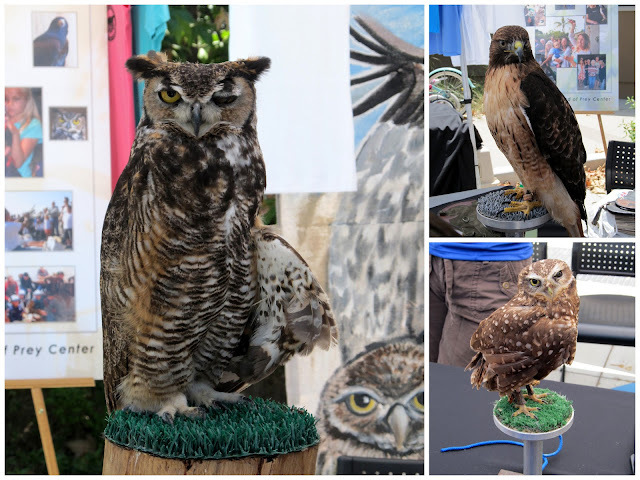 Special guest - Live birds of prey! Campers learn about famous inventors and make inventions of their own. Field trip to Tessman Planetarium. Campers explore creativity in nature with drawing, painting, dance, sculpting and more. Special guest - Southland Opera Company performance of "Adventures in Song and Story"
Campers enjoy safe, age-appropriate, hands-on experiments. Field trip to Discovery Science Center. Who: Elementary students entering Kindergarten through 6th grade. The campers are split into small groups based on age. When: Nature Camp is Monday - Thursday from 9 a.m. to 1 p.m. with an after camp option that runs from 1 p.m. to 3 p.m.
For more information about ENC Summer Nature Camp or to register your camper visit the ENC website.